Way finding has developed from basic maps and signage used to direct large volumes of people in vast locations. These formats relies on visual indicators such as arrows, icons and symbols to communicate to users. Way finding has advanced to digital signage, which allows live data to be instantly updated, unlike a static map. Now, maps have transformed to on screen 2D and 3D digital diagrams using self-service way finding kiosks. Information kiosks are used in a plethora of locations to provide users with simplified directions. For example, hospitals are utilising way finding kiosks to give patients and visitors access to virtual maps of the wards. In retail, shoppers are able to find out locations of shops using interactive applications. Information kiosks are commonly deployed in high-traffic tourist hot spots to provide directions and visitor information. Educational institutions are utilising information kiosks for both way finding and to give prospective students access to course details, payments and registering forms. The benefits of touch screen kiosks are endless from making travelling easier for users to managing large volumes of people in vital locations. 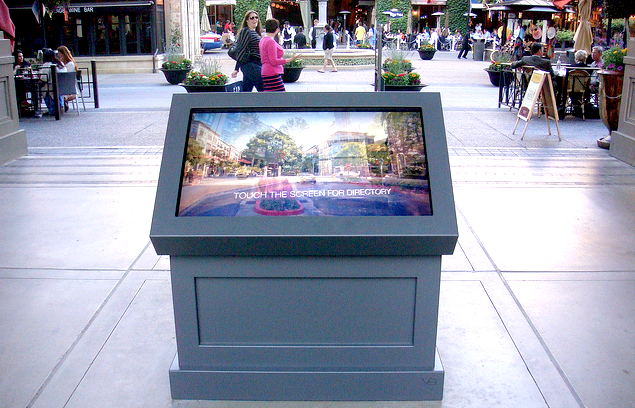 An interactive information kiosk can become multi-functional in providing a variety of services, such as dispensing important information, directing visitors and broadcasting messages. Deploying applications in areas with a large traffic flow of users also opens up advertising opportunities. Take a look at Cammax’s solution, The Waypoint Touch, a system easy to customise fit for all types of locations.